Twenty years ago, MxPx emerged with an infectious attack that helped cement the reputation of a particularly divisive sub-genre — Christian punk. Positive and punchy, the trio of Washington state high schoolers created easily digestible pop-punk earworms that rarely made preaching points of the band's religious ideals but avoided any language or themes that would offend fellow believers. MxPx's success helped pave the way for more overtly religious bands like Relient K and Anberlin. But times change, and these days singer and songwriter Mike Herrera finds himself in a much different place from that of the teenager who applied his spirituality to music. "The reason that I was writing the songs that I was writing was because I grew up going to church," Herrera says, groggy but engaged. It's 3:30 a.m. in Indonesia, where the frontman has just led his MxPx All Stars through a gig on their current world tour. It stops at The Milestone on Oct. 31. A rotating supergroup — the "All Stars" — supports Herrera when his regular bandmates, Yuri Ruley and Tom Wisniewski, cannot. "My family went to church. I had to go to youth group," he continues. "As you grow older, everybody's different. I don't make that a daily part of my life. It's not a big deal, really. It's like that for most people that grow up going to church. I know so many people, fans and friends in the punk industry, that used to go to church when they were kids. There's a ton of us out there, a lot of artists and journalists and music journalists as well. It's funny. We've all had this weird, American Christianity background. And we all go through the same weird experiences from that." This year, MxPx is celebrating two decades of non-confrontational punk. For Herrera, it's been difficult to continue writing honestly positive songs when his beliefs have changed. At 35, he's no longer a church-going man, and while he won't comment directly on his current political and religious views, he speaks of his musical perspective becoming more "sophisticated," making room for multiple points of view — not just the rigid Christian background that defined his band's early work. "I'm not only writing for myself. I'm writing for the audience," Herrera says. "There's a certain amount of honesty that I think some of the younger kids would not be too interested in or stoked about. I'm so different now than when I was writing songs at the beginning of my career — completely different, in fact. In public life, people don't see us as growing up. They don't see us as changing our views and our ideas about the world and what we believe and what we don't believe and what we think politically. Things are always changing. It's always fluid. It's never exactly the same from album to album to album." 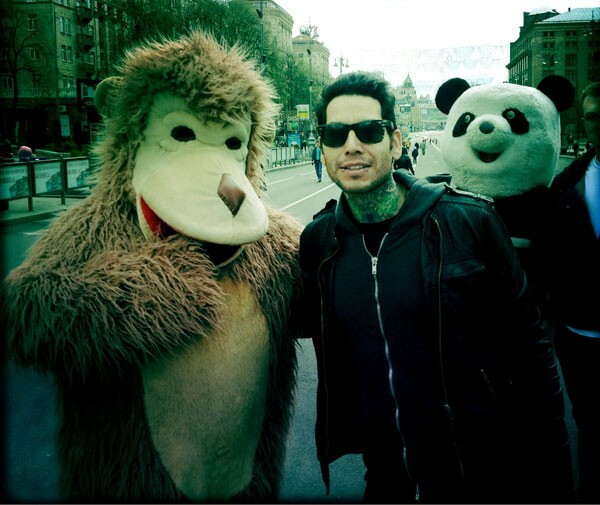 The contrast between Herrera's current outlook and his band's positive energy is captured on Plans Within Plans, the ninth MxPx LP, released earlier this year. The album still occupies the same easily accessible pop-punk structures, but the approach is more aggressive. Pace is pushed to the breaking point. The distortion is rougher. Herrera sings with a road-worn growl. The biggest difference is in Herrera's lyrics, barbed progressions that hint at grown-up frustrations and secular confusion. "With the conflict on the outside and the fear within/ It's hard to find the courage to begin again," he cries on "In the Past," the lyrics undercut by nervy guitar prickles and pounding drums. "I'm one of the downcast, and I don't want this to last," he goes on before his band mates join him on the shouted chorus: "It's in the past!" MxPx has always sounded anxious, but on Plans Within Plans the tone is more desperate. Herrera's foundation of religious simplicity has eroded, allowing doubt to complicate his writing. The resulting songs are some of the most exciting in all of the band's expansive catalog. Herrera has never been one to preach through music. He didn't do it as a devout teenager, and he doesn't do it now as a conflicted adult. When judging his musical peers, he holds them to the same standard. "If it's good songs, it's good songs," he says. "I try to be positive and inclusive of everyone. A band like Anberlin, they're a really great band. They sound amazing. They write great songs. But also a band like The Swellers, who are atheists. They're both great bands. "I don't really think of music as one way or the other," Herrera adds. "Although I lean away from the spiritual Christian stuff, way away from it, in fact. To me, it's just insincere and annoying."